If you're on the search after the true musician, your quest is over. Singer and composer on his own he is a wanderer between the worlds of R&B, smooth jazz, funk and pop. Maryland resident JD has three CD's to his credit, Back in the Day (2005), Sophistication (2007) and his newest release entitled Reflections (2010). With his new album he ties on the music of the great soul and R&B vocalists from the 70's, 80's and 90's. This album is also part of his current Reflections tour, a tribute to the great singers of the past like Bobby Caldwell, Luther Vandross, Phyllis Hyman, The Temptations, Kool and the Gang, Jeffery Osborne, Brian Mcknight and many others. Enjoy this trip on the memory lane in his show and on his new album Reflections. If You Were Here Tonight was Alexander O'Neal's first hit from his self-titled debut album (1985). JD presents a personal emotionalized rendition of this powerful ballade. The Spinners' world hit I'll Be Around (1972) is freshly retuned in a reggae-flavored piece with great support of keyboardist and arranger Chris Williams, David Dyson on bass and drummer David Prince. Playing Your Game (Sings for Someone You Love, 1977), a popular song by late Barry White is JD next choice. The Isley Brothers released For The Love Of You in 1975. Covered by numerous artists like Whitney Houston (Whitney), Norman Brown (After The Storm), Earl Klugh (Life Stories), Peter White (Playin' Favorites) this song is a charm. JD is in good company. Inside My Love from Minnie Riberton's album Adventures in Paradise (1975) is her legacy to the world. I especially like Marcus Mitchell's sax solo on JD's treat. Diamond In The Back is an Urban detour from William DeVaughn's Be Thankful for What You Got (1974). JD owns the song. Also remarkable David Dyson signature bass alignment. I Just Want To Love You was written by Trendle Thomas (The Ron Smith Group, Big Bang Method), a professional keyboardist with a perfect feeling for the right atmosphere. Yearning For Your Love is accompanying me since the Gap Band presented it (Gap Gold), Alex Bugnon wrapped it into piano notes (Love Season), Kevin Tooney turns the song into a star with Evelyn "Champagne" King (Strut), Patrick Yandall reminds at the song (Laws Of Groovity) and JD puts the icing on the cake with his version. I Want To Love You Baby is JD's own creation closing the gap between past and presence. Every time has his own hero. Kenny Loggins' This Is It from his album Keep The Fire (1979) has an own story. Kenny explained it to his friend and co-singer Michael McDonald,"It's not a love song. It's a life song." Coherently JD puts all his heartblood into this song. Games from Chuckii Booker's second solo album Niice 'N Wild (1992) has a melodramatic attitute, while Chuckii's career as musical director and producer was splendid and breathtaking. A great blueprint for a singer like JD. We Both Deserve Each Other's Love was Jeffrey Osborne's opinion performed on L.T.D. 's Togetherness (1978). JD turns this bold ballade into gold. Latest Greatest Inspiration was one of Teddy Pendergrass's terrific songs from his groundbreaking album It's Time For Love (1981). Many wedding planers have this song in their repertoire. Now they can add JD's rendition. JD's Groove features the excellent Marcus Mitchell on sax. Marcus, we hear you! But this song is foremost a Thank You to all participants of this album. 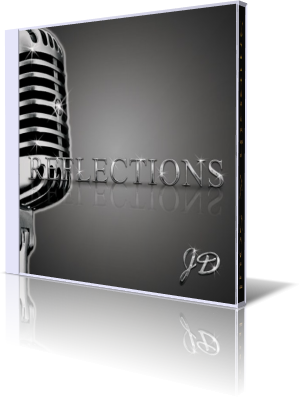 JD's cover album Reflections is a joyful encyclopedia with some fine jewels taken from the early R&B time. A crossover album to remember.